How do you measure the popularity of a business school? U.S. News does it by equating popularity with yield rate (the percentage of accepted applicants who go on to enroll). 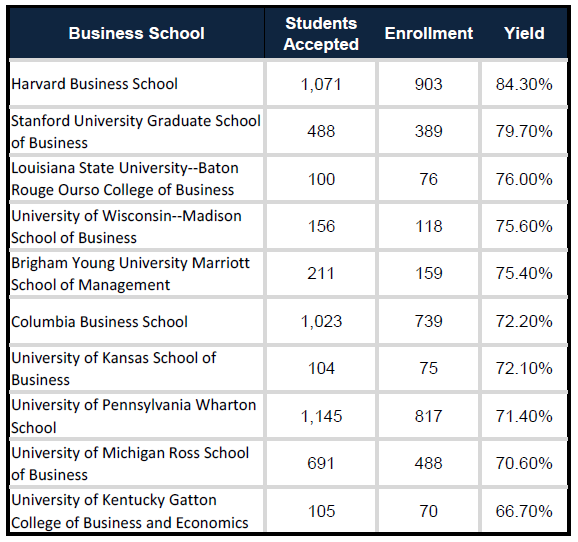 Here are the Top 10 Highest Yielding B-Schools. There’s a mix of schools with varying stature in that list, but there doesn’t really seem to be any broad conclusions that can be drawn about what made a business school popular this year, at least from a list of only ten schools. Popularity has so many components, always shifting, surging and receding, it would require looking at more longitudinal data to develop any ideas on what, besides rank, makes certain schools more or less popular. Does Your Resume Follow These Guidelines, Young Jobseeker?